Prepare and complete your application for PR Card renewal today! Complete your application quickly and correctly with our step-by-step guidance that leads you through each question. Immigration Expert Review now available with your application package. Who is Eligible for a PR Card Renewal? replacement of a PR Card that has been lost, stolen or damaged. 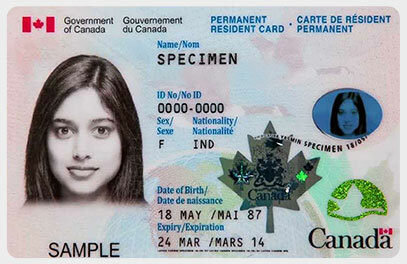 The application process to renew a PR Card for Canada requires individuals to file form IMM 5444 and submit the required documents in order to replace the card that has expired or will soon expire. Lost, stolen, destroyed or expired immigration documents issued by the Government of Canada can be replaced. To have a PR Card renewed, individuals must complete an application and pay the applicable processing fee. There is no need to contact the IRCC (formerly known as CIC) if your card has expired (or is due to expire). Your Permanent Resident Card (if your card has expired). If it is due to expire, you can keep it with you and return it to the IRCC (formerly known as CIC) officer at a local IRCC (formerly known as CIC) office when you go to collect your new card. A copy of your valid passport or travel document, or a copy of the passport or travel document you held at the time you became a permanent resident. Please note that if photocopies are not clear, your application will be returned to you. What Are the Steps in the PR Card Renewal Process? Pay the government filing fee online. The fee paid to the Government of Canada is separate from the fee paid to Immigration Direct. Upon approval of your application a PR Card will be sent to you.